I normally drive a manual transmission, and generally prefer to, but I'm not blind to the charms of an automatic. Shifting your own gears — what are we, animals? Sure, I get why people want it. And I imagine everyone who's spent any amount of time in an automatic must have wondered, at least once, why PRNDL? Specifically, why that order? I mean, sure, it's fun to say "purndil," but wouldn't LNDRP ("linderp") be fun too? What about NDLPR ("niddleper")? They're all pretty good, right? But, that's not the case. It's PRNDL, everywhere you go, counting for regional dialects like PRNDL2 or PRNDD3L, which are really, fundamentally, still PRNDL. Car companies have their own idiosyncrasies about all sorts of things (Saabs with floor-mounted ignition, Subaru and boxer engines, BMW and parking across two spaces) so why not this? Well, it turns out, lots of reasons why not this. Back in the day, cars did, in fact, do their own thing automatic-gear-order-wise. It was a wild, lawless time. Many cars had no park setting. Other cars dispensed with gearshifts altogether, relying on exciting push buttons mounted in exciting places, like the exact spot where all your muscle memory tells you to pound when you want to hit the horn. One of the more common layouts (used on GM Hydra-Matics and Borg-Warner automatics, among others) back in those dark ages was PNDLR. That seems pretty comparable to PRNDL, right? What could be wrong with that? Let's think about it. You're in a ‘50s era, say, Studebaker, a big heavy car, and you want to race some punk in a hopped-up Model A at a stoplight. Winner gets your wildly fickle girlfriend (I'd say "or boyfriend" but, come on, this is the ‘50s). So you drop into N, rev that big straight 6, and when the lights turn green, jam it into L for maximum torque off the line. Instead, you stomp the gas, and rapidly back up the hood of the Crosley behind you. Because, dummy, R is right there at the end, after L, and it's alarmingly easy to pull the lever all the way over instead of stopping that one important stop before. This scenario was actually common enough that it was Chapter 2 in Ralph Nader's Unsafe at Any Speed; apparently that book wasn't just all about taking our Corvairs away. In addition to the wrong-direction takeoff scenario, layouts that didn't separate forward and reverse gears with neutral were criticized as well, both for safety and technical reasons, since both people and machines aren't that crazy about abrupt changes of direction. Eventually, the PRNDL shift order was mandated by law, specifically US Department of Transportation Standard No. 102. 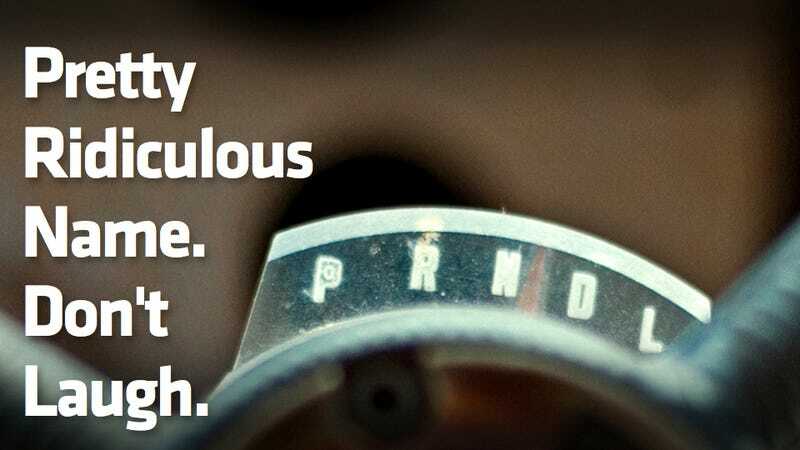 So, PRNDL is not just a good idea, it's the law. But since the government's making us use it, there's got to be some sort of more sinister reason, right? It can't all be about rear-ending people and lunching your gearboxes. So, to help you out, I'm providing you with this handy list of ten conspiracy-theory friendly alternate meanings for PRNDL. Enjoy, and feel free to add your own in the comments!